The final concert in the 5 at the First series featured two clarinet quintets, one by Mozart and the other by Brahms, that were very different from one another. The concert opened with a young performer, Chloe Hewitt, playing from Bach’s Partita #2. This complicated work was well played even though Hewitt appeared nervous and failed to acknowledge the audience in any way. The first of the Quintets, this one by Mozart was composed for Anton Stadler who mastery of the instrument he admired. Stadler had invented the basset clarinet with its register down to the low C and it was for this instrument that Mozart wrote. Today we heard it played by Yao Guang Zhai who is an Associate principal clarinet with the Toronto Symphony Orchestra. 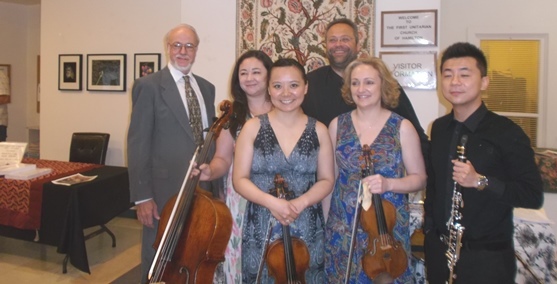 The rest of the quintet was made up of Marie Bernard and Yonatan Brick, violins; violist Tang Li, and Rachel Mercer, cello. Sponsoring the evening was Francois Verschaeve. Each of the players is a professional musician with an impressive bio and three of them had 18th century instruments they had earned the right to play. I do not know how much time they had to practice together, but they sounded wonderful playing this very familiar piece. Mozart was at the height of his powers and in fact only two years away from death, but there is no hint of that in the music. Written in A major, the piece is warm; light; playful and optimistic. I especially like the final movement which takes us back to the sublime theme; gives the viola a chance to shine before the rest of the strings join in for a wallow in pathos abruptly interrupted by a joyfully playful clarinet. It was totally satisfying to hear such excellent musicians play this marvelous music. After intermission they moved on to the Brahms Clarinet Quintet in B minor. Brahms had already retired from composing when he heard Richard Muhlfield play and was moved to compose four clarinet pieces for him. This Quintet for Clarinet and Strings is very different from the Mozart. Here we have a definite sense of impending mortality. It is dramatic and intense and at time has a somber longing, and even the nostalgic andantino has a desperate playfulness to it. Finally though one gets a sense of acceptance and winding down and the music ends quietly with peace. Throughout these two glorious pieces of music the playing was masterful, especially by Zhai who appeared to enjoy it as much as we did. The standing ovation from a full house audience was well deserved.